To unravel who's right, it's important to start with the law at issue. It's rare for any issue to unite Republicans and Democrats in Washington, but both parties in Congress are demanding the Trump administration investigate what role Saudi Arabia's Crown Prince Mohammed bin Salman reportedly played in the murder of Washington Post columnist Jamal Khashoggi. In October, the top Republican and Democrat on the Senate Foreign Relations Committee triggered an investigation into Khashoggi's killing, giving the administration 120 days to provide a report to Congress. 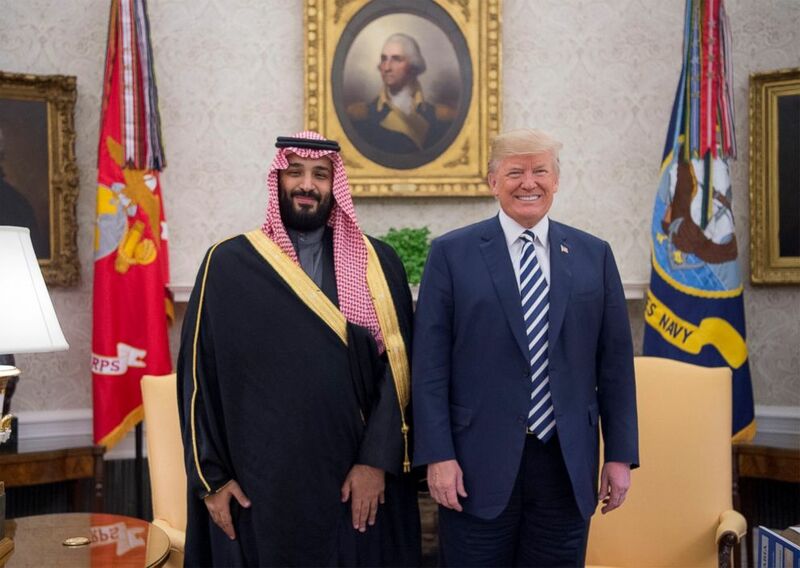 They later amended that to specifically inquire about the role of the crown prince, sometimes known by his initials "MBS." But the administration has refused to issue a report on that question, flying past the deadline to notify Congress of its findings last Friday. While members of Congress have accused the White House of not complying with the law and even "covering up" a murder, the administration has countered that it is within its power as the executive branch to set foreign policy and essentially ignore the Congressional reporting requirement. "This falls in a highly contested area historically between the executive and legislative branches," said Jonathan Turley, a constitutional law professor at George Washington University. "Both branches have compelling arguments to make." To unravel who's right, it's important to start with the law at issue: The Global Magnitsky Human Rights Accountability Act, signed by President Barack Obama in Dec. 2016. The law gives the White House the ability to sanction foreign officials for engaging in human rights abuses or significant corruption, requiring an annual report on that every December. It also gives Congress the authority to require the administration to investigate a particular individual for human rights abuses or corruption and provide lawmakers a report within 120 days that includes whether or not it will impose sanctions on that person. "The President shall determine if that person has engaged in such an activity; and submit a classified or unclassified report to the chairperson and ranking member of the committee or committees that submitted the request," the law says. "A simple reading of the law would show that there's no wiggle room here given to the executive branch, to the president in terms of whether to provide the report that was requested by Congress," said Jordan Tama, a professor at American University and research fellow at its Center for Congressional and Presidential Studies. (Alex Wong/Getty Images) Sen. Bob Corker (R-TN) (L), chairman of the Senate Foreign Relations Committee, talks with ranking member Sen. Bob Menendez (D-NJ) prior to a committee meeting, April 23, 2018, on Capitol Hill. In this case, Sens. 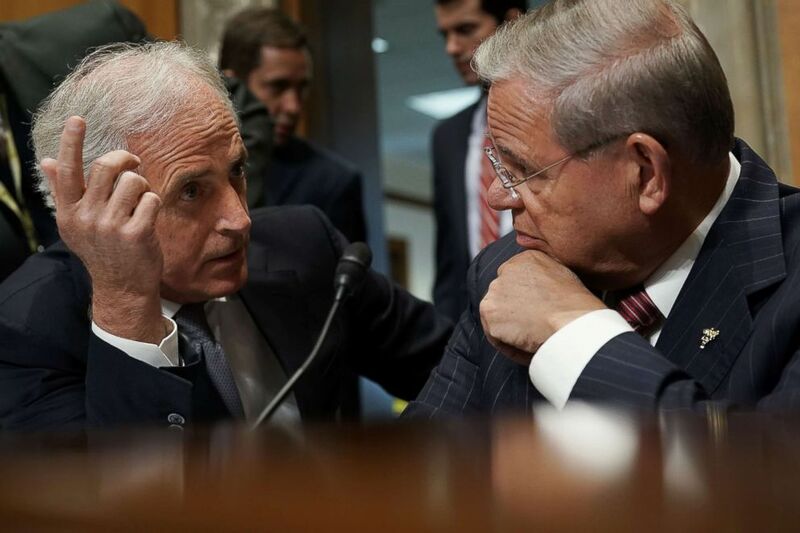 Bob Corker and Bob Menendez, the top Republican and Democrat on the Foreign Relations Committee, wrote a joint letter to President Donald Trump requiring an investigation into Khashoggi's death, days after he disappeared inside the Saudi consulate in Istanbul, Turkey. In November, the administration sanctioned 17 Saudi officials after imposing visa bans or revocations on them and four others. All of those individuals had already been implicated by the Saudi government, which blamed a rogue operation ordered by the deputy intelligence chief and with no knowledge of the crown prince. But members of Congress who were briefed on what U.S. intelligence knows about the killing have loudly and publicly said the crown prince was responsible, so days after those sanctions, Corker and Menendez wrote a follow-up letter to Trump, specifically inquiring about the crown prince's role and asking for an answer within the original 120-day deadline. 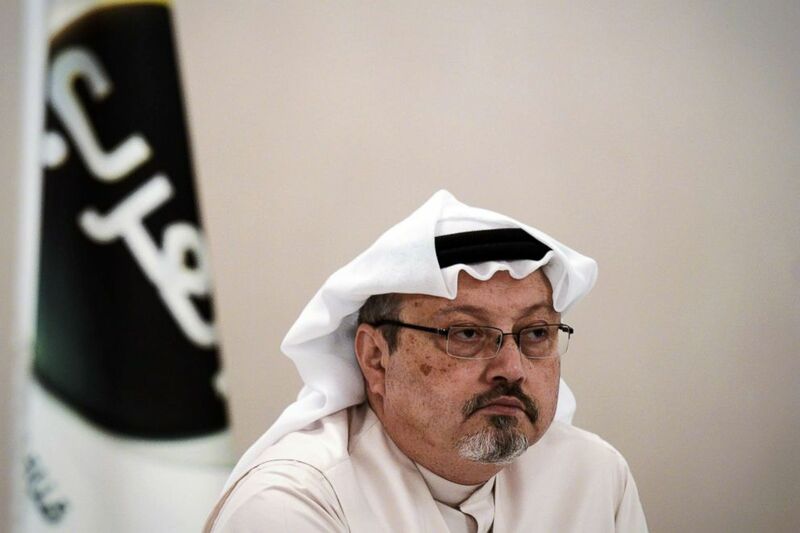 When the deadline came last Friday, however, they instead got a letter from Secretary of State Mike Pompeo, reiterating a commitment to "use relevant authorities as appropriate to promote accountability" for Khashoggi's murder. He made no mention of the crown prince. Republicans joined Democrats in outrage. "I am deeply troubled by the letter I received from the administration," said Rep. Michael McCaul, R-Texas, the top Republican on the House Foreign Affairs Committee. "I call on the administration to immediately comply with the requirements of the law, and to provide Congress with the information required." Sen. Marco Rubio, R-Florida, told ABC News, "They certainly should have issued the report. The law requires it." 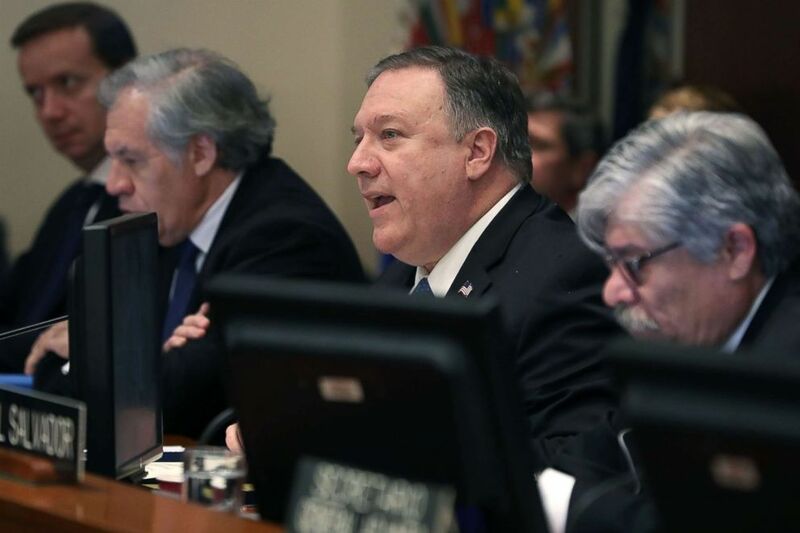 (Mark Wilson/Getty Images) Secretary of State Mike Pompeo, center, speaks during a meeting of the Permanent Council of the Organization of American States (OAS), Jan. 24, 2019 in Washington, D.C. But the administration has not budged, instead pointing to Obama's signing statement when the law passed in 2016. While a former National Security Council official in the Obama administration told ABC News they would have been "much more proactive in terms of responding to this" request from Congress, they agreed, "The Trump administration has some degree of leeway or license here when it comes to ignoring that." Some constitutional lawyers, however, disagree. "If the president signs the law, it's still the law of the land, and a signing statement has no legal standing," Tama told ABC News. "It's always been considered part of Congress's constitutional authority to require executive branch reports, and there are countless reporting requirements," he added, although he said it's not unusual for administrations to ignore some. That oversight authority is particularly relevant here, scholars said, because it involved a member of the press working for a U.S. publication and living in Virginia. "Congress has a profound interest not simply in foreign relations, but in the protection of a U.S.-based journalist," said Turley. The difficulty is that this issue of authority has never really been worked out in the courts. "There is no real direct case on this point," Turley said, in large part because, "Neither branch wants to litigate these questions because there's too much you can lose." "What the recourse is on it is an open question. It's never been challenged before in this way," Rubio said. But while a lawsuit isn't likely here, Congress can't easily compel a report. As Sen. Chris Murphy, D-Conn., told ABC News, "There's nothing more we can do. It's not like we can send somebody over to the White House to force his hand to write the certification to Congress." Instead, several experts said, there are other steps it can take to push the administration -- or punish it. In the end, that could hurt the administration's efforts to protect the relationship with Saudi Arabia even more. "The administration would be better served by saying in essence we are under no legal obligation to make this determination, but as a policy matter, given the importance of this issue and Congress's clear intent, we are electing to inform House and Senate leaders of our findings," said Rob Berschinski, who worked on human rights issues under Obama at the White House and State Department. That doesn't seem likely, giving fire to legislative actions from withdrawing U.S. military support for the Saudi-led coalition in Yemen to a ban on certain weapons sales to Saudi Arabia to mandatory sanctions on anyone found responsible for Khashoggi's killing. All of those ideas have already been wrapped into a bipartisan bill introduced last week, even before Pompeo's letter. ABC News's Ali Rogin contributed to this report.